For nearly four decades, Porsche has held the lap record for Nurburgring’s Nordschleife race circuit. It was a record set by Stefan Bellof at the wheel of the powerful Rothmans Porsche 956 C. The new mark came during practice for the 1,000-kilometer WEC sports car race. Average speed was over 200 kmh. Friday morning, another Porsche slammed the former record. A Porsche 919 Hybrid Evo, driven by Timo Bernhard, erased the old mark with an average speed of 233.8 kmh (about 145.3). During the run, Berhard lapped the 12.94-mile Nordschleife in 5:19.55. Bellof’s race was 6:11.12. For 35 years, no one contested Bellof’s feat. He was called the most significant racing talent of his time. He died tragically behind the wheel of the Porsche at Spa-Francorchamps in 1985. Friday’s success is the second track record for the Porsche 919 Hybrid Evo Tally. On April 9, 2018, in Spa, the dramatic evolution of the Le Mans winner tapped faster than a Formula One Car. Driven by VW works driver Neel Jani, himself a Le Mans winner and Endurance World Champ, the Evo set a lap of 1:41,770 on the 4.35-mile track. Spa, set in the Belgian Ardennes mountains, has played host to other lap winners recently. Jani erased the record set by Lewis Hamilton, a 2017 qualifier, by 0.784 seconds. The British Mercedes driver owned the pole for the event, the Belgian Grand Prix, with a time of 1:42.553 minutes. 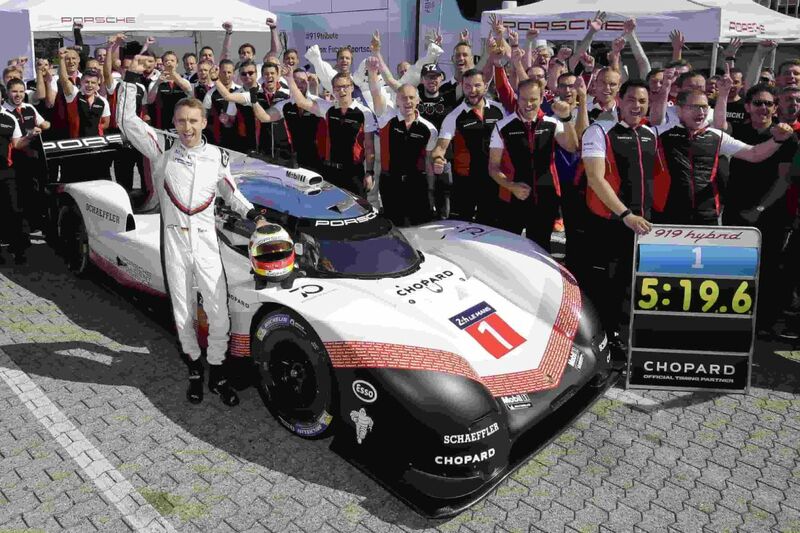 The Evo version of the Porsche 919 Hybrid, based on the car that took outright victory at the Le Mans 24-Hours, and made the FIA World Endurance Championship in 2015, 2016 and 2017. Over the winter, engineering looked at and changed the car. For example, its hybrid powertrain now develops a system output of 1,160 hp. The Evo’s modified aerodynamics generate over 50 percent more downforce compared to the WEC model. Top speed at the Nürburgring was 369.4 km/h (229.5 mph)..